A winter road trip in Canada isn’t as crazy as it sounds, especially on Vancouver Island, which typically has a mild climate year-round. (Although this year is an exception.) My nearly grown sons and I have just left a family reunion in Whistler and we’re taking the car ferry over from Vancouver. We’ll be hitting Nanaimo, Tofino, Ucluelet, and the capital of British Columbia, Victoria. Then we’ll take the seaplane back to the mainland, Vancouver. Come with! On the car ferry from Vancouver (Horseshoe Bay) to Nanaimo on Vancouver Island (Departure Bay). Outside it’s brisk and bracing; inside it’s comfortable with every convenience. The cafeteria serves a wild-caught salmon salad that rivals top restos back home. Arriving at Nanaimo on the car ferry from Vancouver, the light is magical, giving this church (St. Peter’s) an ethereal glow. My sons and I are on a quest to find the best Nanaimo bars (a heavenly dessert made here) but alas, shops are closed. It’s the only sad note to an otherwise happy new year. Is it a Mondrian? No, it’s Nanaimo. Quick stop in this Pacific coastal town on the eastern shore of Vancouver Island for one thing. When in Nanaimo.... This Pacific coastal town is known for its eponymous chocolate dessert bar. This one is a salted caramel variant from Bocca Café. Delish. There’s an entire Nanaimo Bar Trail for sugar-rush seekers. Vancouver Island, British Columbia. Into the woods of Vancouver Island, the largest island in the Pacific east of New Zealand. On the scenic drive from Nanaimo to Tofino, it’s nice to have a chauffeur, or two. The pacific early 2017 view of the Pacific from the Great Room of Tofino’s Long Beach Lodge. Vancouver Island, British Columbia. 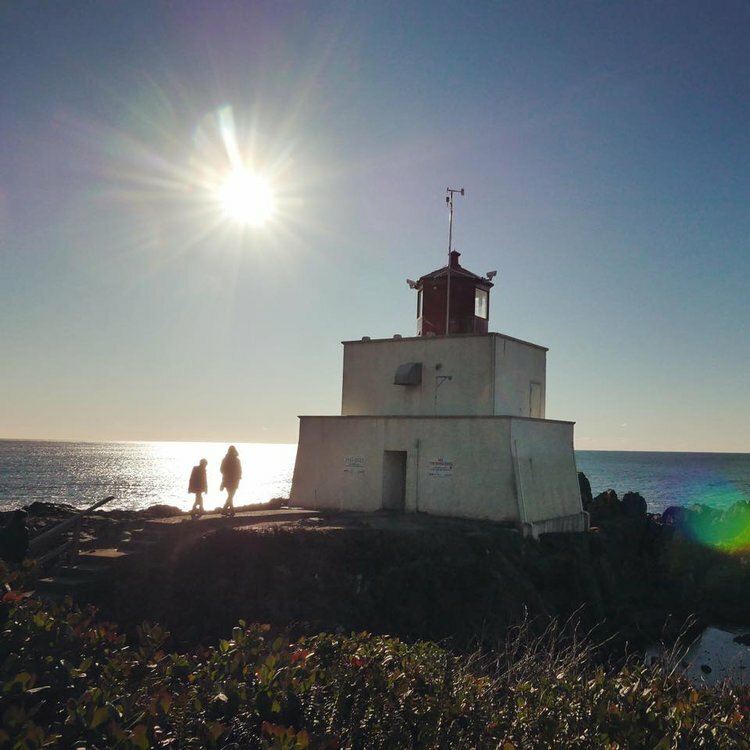 Lighthouse Loop, an easy but gorgeous walk on the Wild Pacific Trail in Ucluelet on Clayoquot Sound. 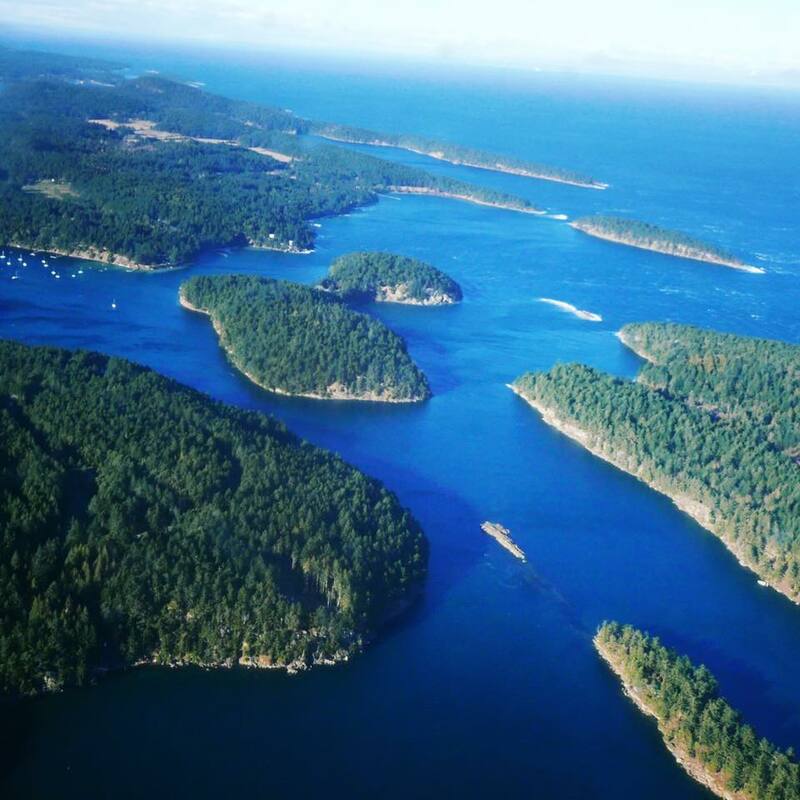 This region is the traditional grounds of the Nuu-chah-nulth First Nation. I love a holistic concept they have called Hishuk Ish Tsa’walk, that everything is one, everyone is connected. Indeed. 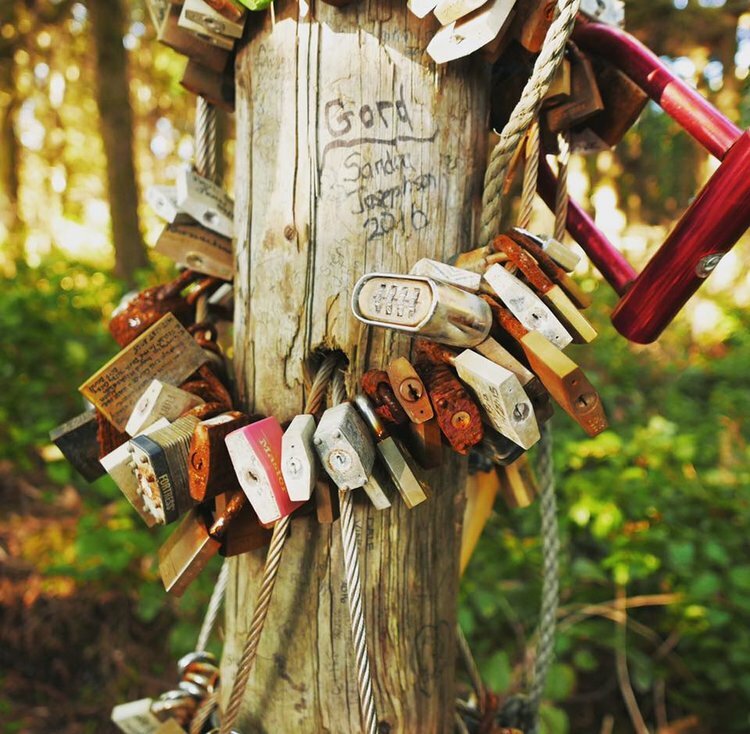 Locks and love notes along the Wild Pacific Trail. Ucluelet, Vancouver Island. Best seat in the house: There are nooks like these all over the Lighthouse Loop, along the Wild Pacific Trail. Ucluelet, on Vancouver Island’s west coast. Amphitrite Lighthouse, along the Wild Pacific Trail. Despite this, many ships foundered on these rocky shores. Ucluelet, Vancouver Island, British Columbia. Surf town: Sunset on Cox Beach and the surfers are calling it a day. Tofino’s beaches are popular with surfers, even in winter (5mm wetsuits are key). As one surfer told me, “There are bigger waves elsewhere but here we have consistent, reliable waves.” They’re particularly good for beginners. I got a lesson; it wasn’t pretty, but I made it up on the board for two seconds. Now my shoulder hurts. One more from the short but sweet Lighthouse Loop on the Wild Pacific Trail overlooking the Clayoquot Sound on Vancouver Island’s west coast. Green, serene: One of Tofino’s loveliest walks, the Schooner Cove Trail winds through moss-draped cedars and over trickling streams, ending at expansive Long Beach. Natural sand art at the the north end of Long Beach. Schooner Cove Trail, Tofino, Vancouver Island, British Columbia. Pit stop at the gas station and market owned by the Tseshaht First Nation, and graced by a pair of hand-carved totem poles. 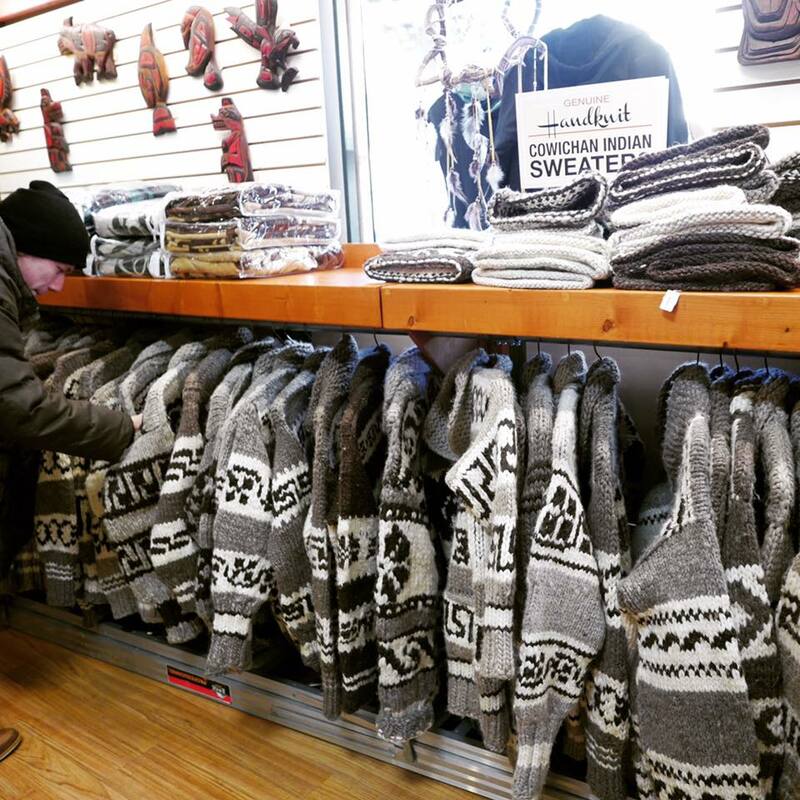 The store is a good place to pick up affordable souvenirs. 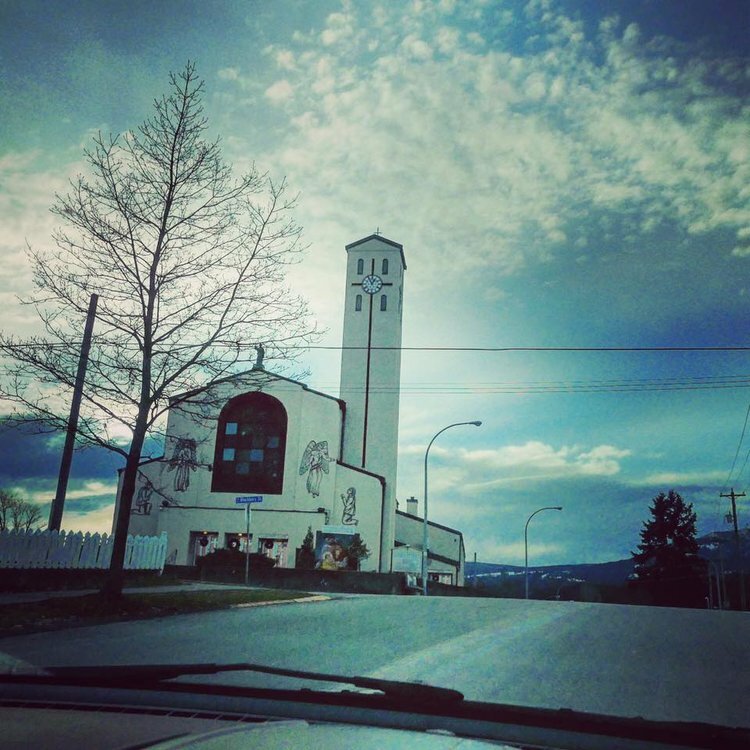 Port Alberni, Vancouver Island, British Columbia. 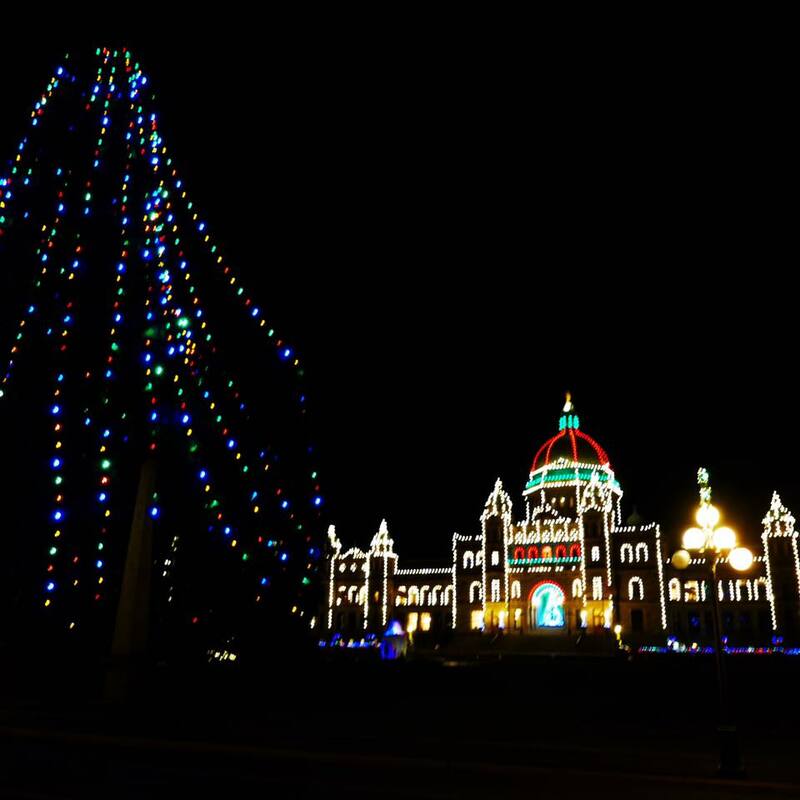 Arrived in chilly Victoria in time to see the city (and the Legislature Building) all lit up for the holiday season. British Columbia. Craft cocktails, housemade bread, and locally sourced New Canadian cuisine at Little Jumbo, in Victoria, BC. 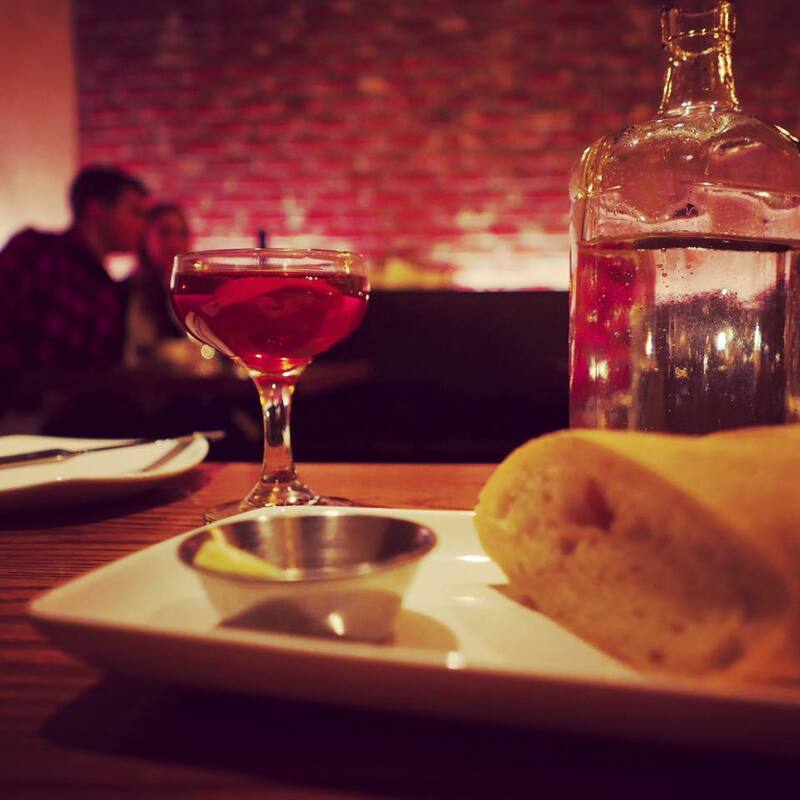 This city has a wealth of independent restaurants and bars. That’s my room, at the Inn at Laurel Point, with the expansive balcony and the splendiferous view of Victoria’s Inner Harbour. Too bad it’s freezing outside. 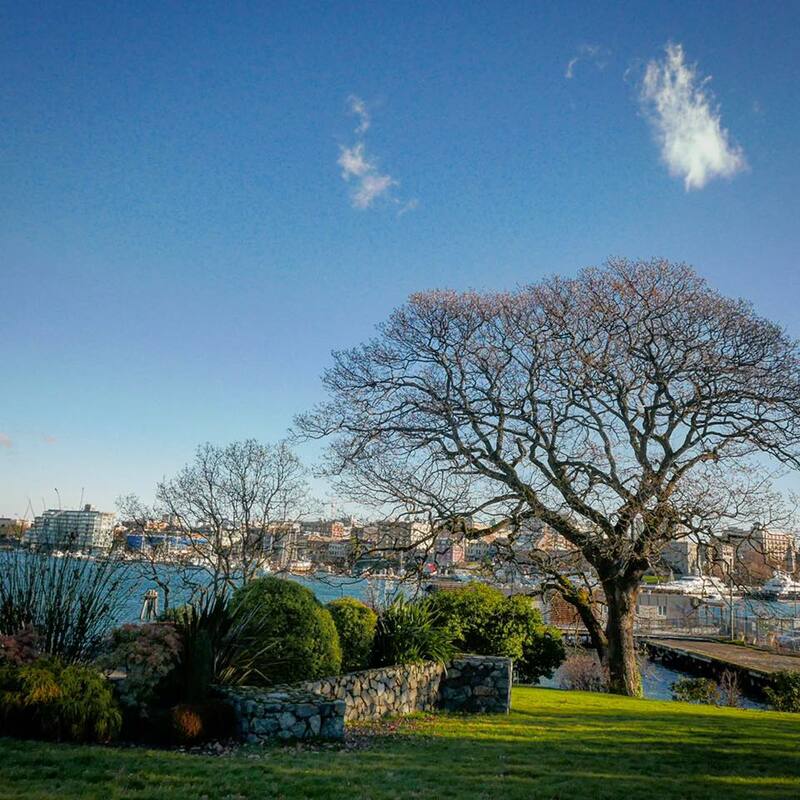 Victoria’s Inner Harbour on a cold winter’s day in January. Locals say it’s not normally this cold. 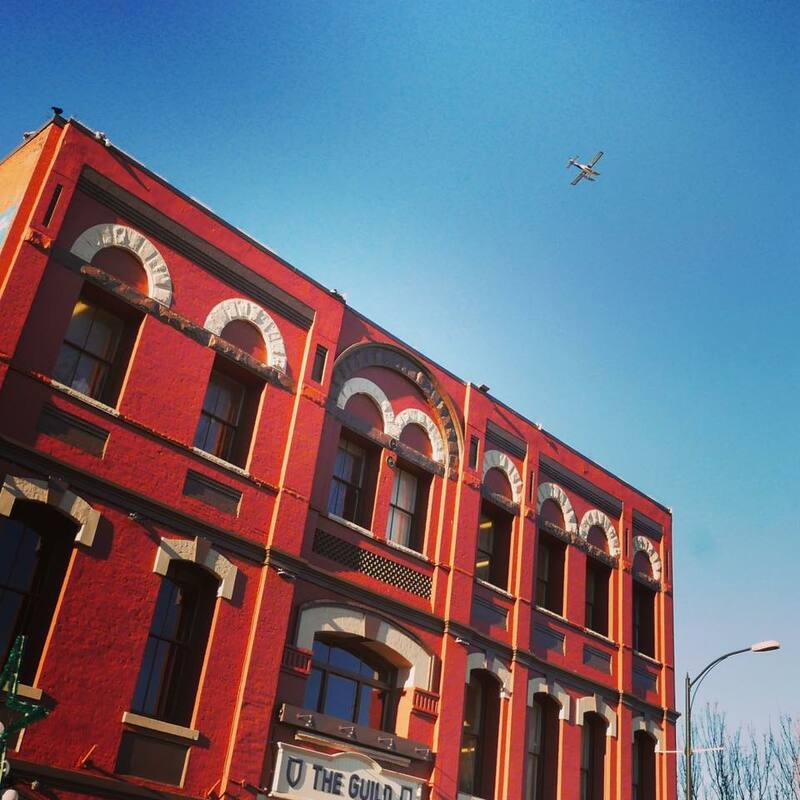 Victoria, BC, has many preserved Victorian- and Edwardian-era buildings. This red number is from the 1880s, once housing a ship chandler, now a restaurant. A seaplane hovers above, a convenient way to get off the island. Popped into a gallery selling travel posters and art prints, chatted with the owners’ (2 brothers) charming mother, and son Ned bought the Long Beach print (bottom). Victoria, BC. Lunch was another locally sourced, crafty indie. A Belgian blond brew from BC, smoked tuna sandwich with bacon and avocado mayo, and a local roast beef melt. Great meal, cool space, at a very reasonable price. 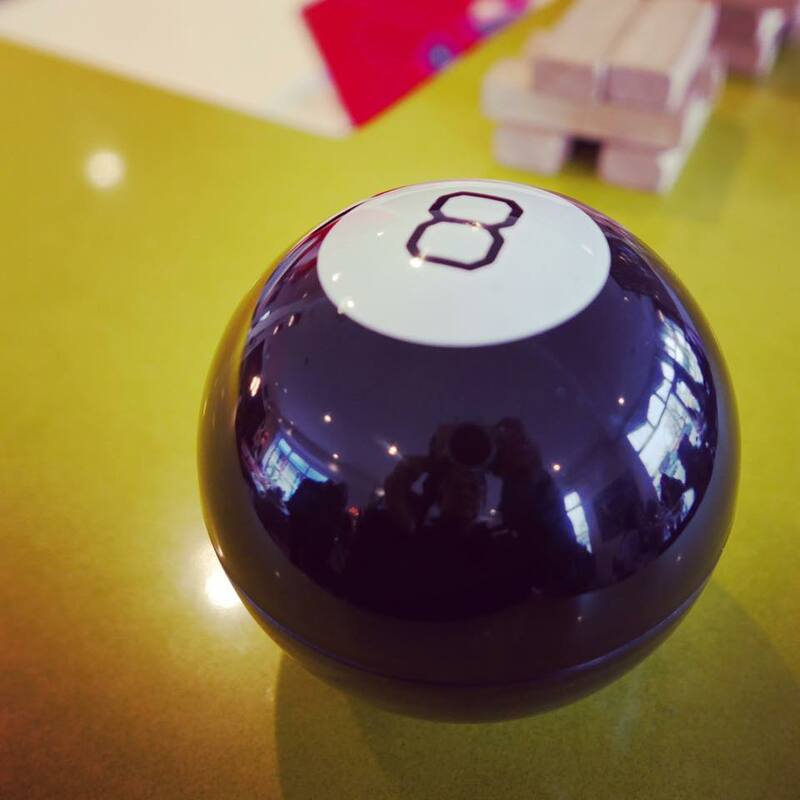 (Plus, U.S. dollar holders, the exchange is in your favor.) Victoria, BC. 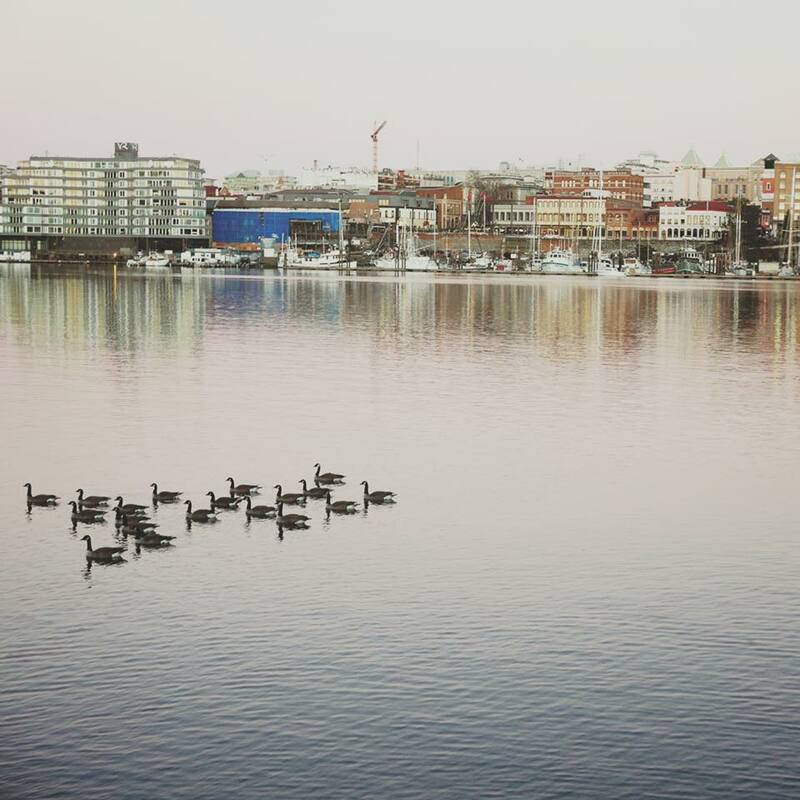 Canada geese on Victoria’s Inner Harbour on a winter’s day. A late afternoon walk along the David Foster Harbour Pathway took us to the Fisherman's Wharf. At the end of it are 33 private float houses. Living there with those views must rock. Did anyone see Sleepless in Seattle? Wrong city, I know. Nevertheless, I was looking for my Tom Hanks, but alas, the place was deserted. (That’s a mannequin on the deck of the house at left.) Victoria, BC. Another meal, another farm-to-fork, local restaurant. Victoria supports its independent establishments. 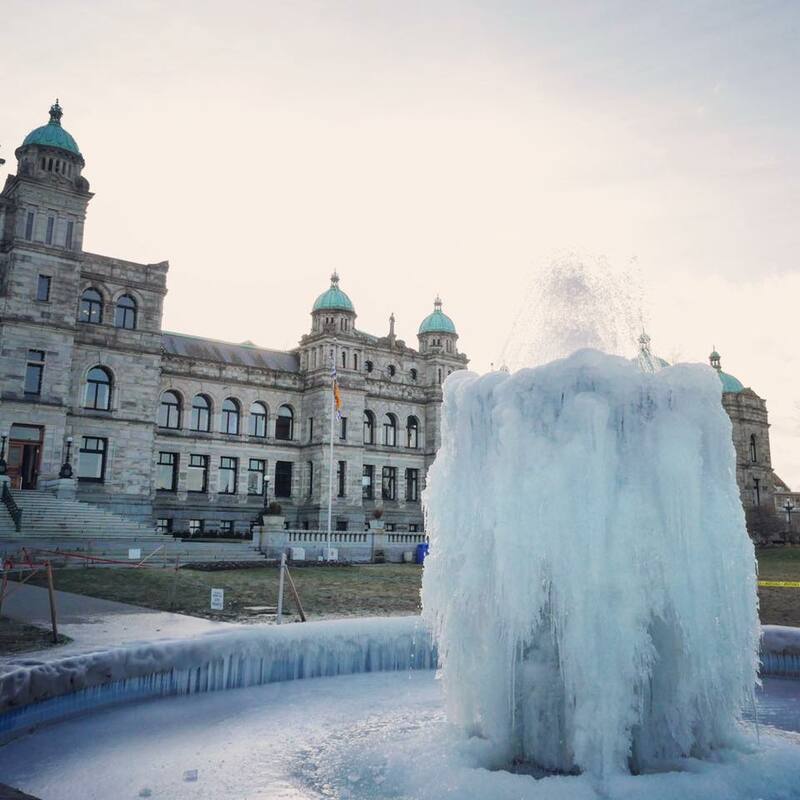 Mostly frozen fountain at the Legislature Building. Victoria is having an unseasonably cold snap, though today wasn’t bad; it was in the mid 30s F.
Food truck fare at the courtyard of the Royal BC Museum. Twin-patty burger with aioli and beets, a chickpea burger, fresh-fried vegetable chips, and local orange cream soda from Dead Beetz food truck. Wooly mammoth at the excellent Royal BC Museum, covering the province’s nature and peoples. Don’t miss the collection of totem poles, and the exhibit of First Nation languages. There’s a valiant effort to keep the rich languages alive but many are endangered, with a dwindling number of fluent speakers. It’s definitely sweater weather, so a little shopping is in order. Ned ended up with a sweater he liked at a price he liked down the street at the Salvation Army thrift store. Victoria, BC. 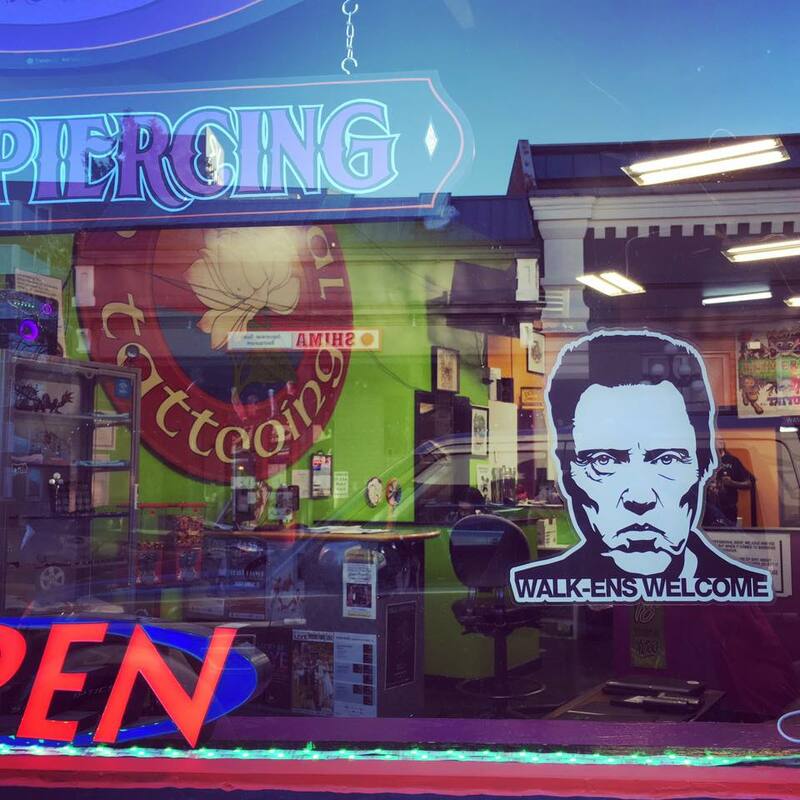 Funky town: Downtown Victoria has its share of tattoo parlors, head shops, and stores selling comic books, games, and vintage clothing. Canadian artist Robert Bateman’s wildlife paintings are world famous. I like this sweet one titled “Salt Spring Sheep.” The artist still lives on nearby Salt Spring Island and now dedicates his life to protecting nature and getting kids out to experience nature. The Robert Bateman Centre at Victoria’s Inner Harbour has a collection of his work. 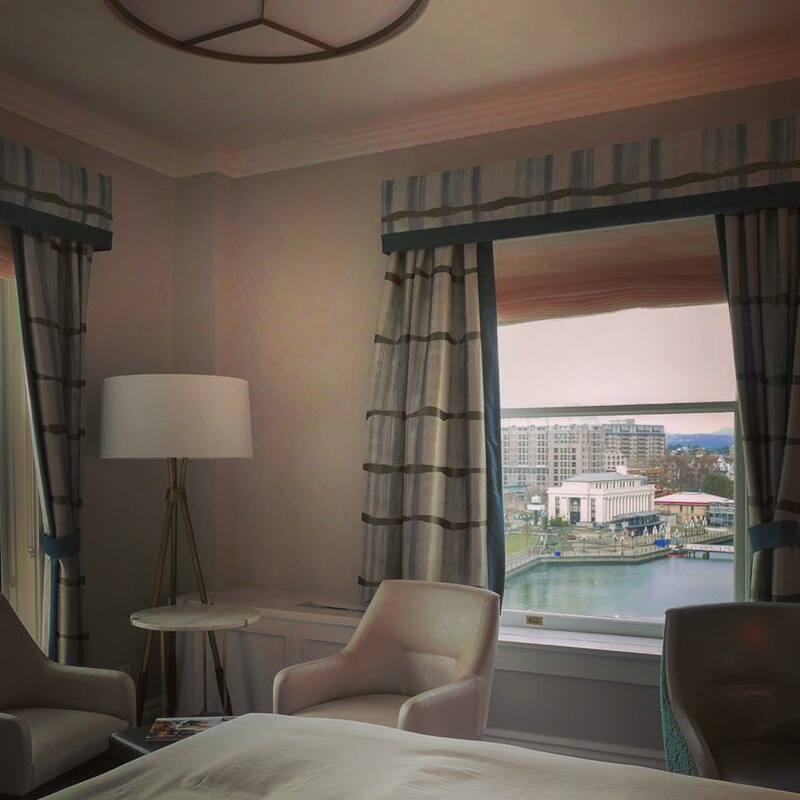 The view from the renovated rooms at the venerable Empress are, well, empressive. I can see the Legislature Building, the Inner Harbour, the Royal BC Museum, really all of Victoria from this cozy but comfy corner room. Tall trees in Victoria: The dog-friendly trails around Hatley Castle and Royal Roads University in Victoria, BC, go through streams and old-growth forests. 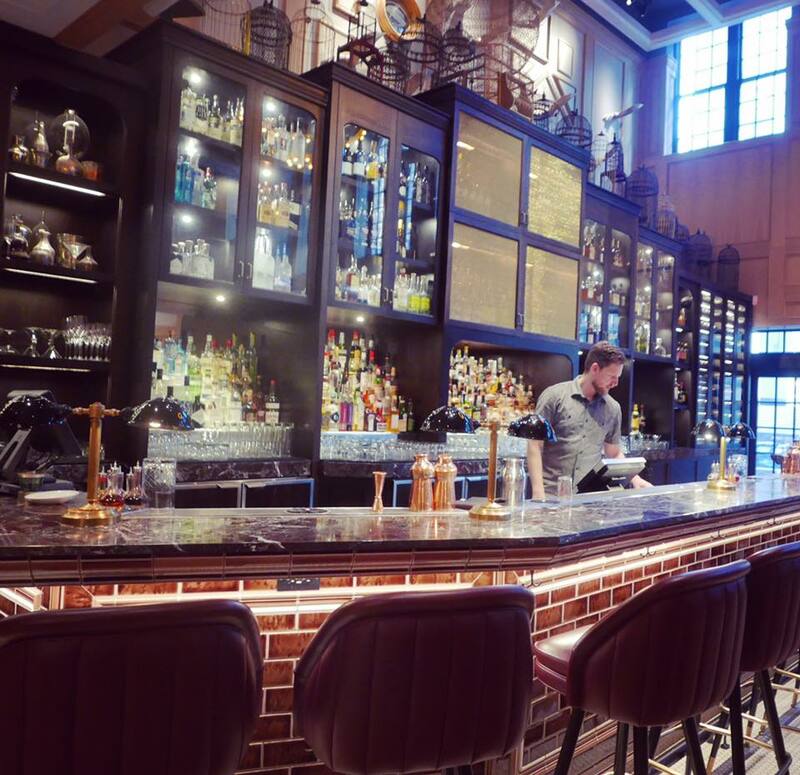 Updated classic: The new Q Bar at the Empress, with its mod portraits of Queen Victoria, is a great spot for a nightcap, or a daycap. 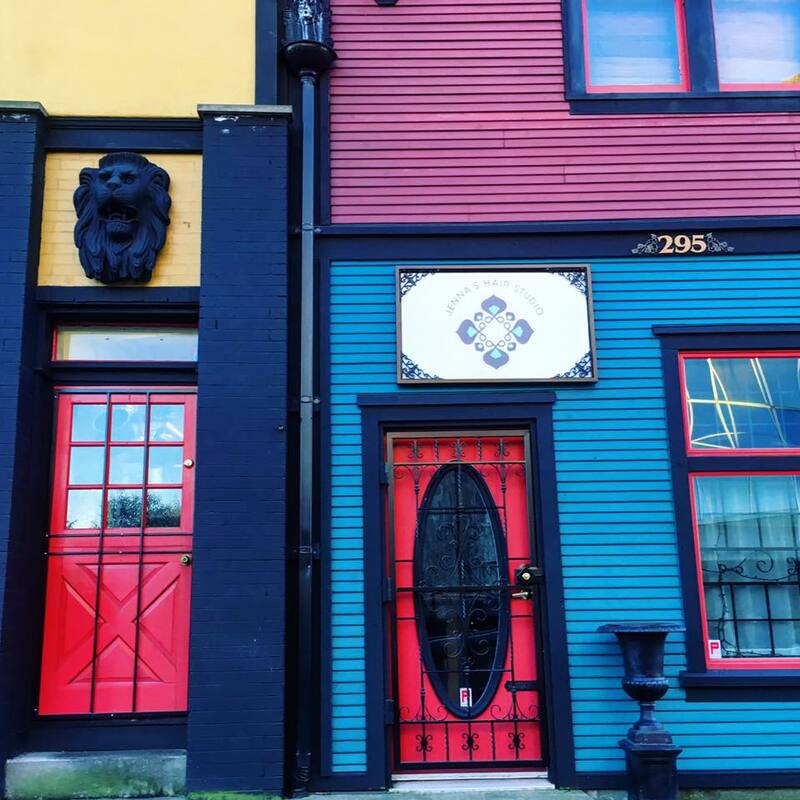 Veganlicious delights in an upscale setting at be love on Blanshard Street, Victoria. The green curry bowl and Mama’s Magic hot tonic (honey, ginger, lemon, cayenne) is a warming winter combo. Dusk and dark come early (by 4pm) in winter. View from a room window of the Empress, Victoria’s most famous hotel and one of its oldest. The Edwardian chateau-style hotel opened in 1908. Retro cool: A working postal chute, going all the way to the sixth floor, at the Fairmont Empress. You write a letter, put it in an envelope, seal it, stamp it, and put it in the chute. Days later, the recipient gets the actual letter. Nifty, eh? I can see the USA from here: Dallas Road, along the water, is a favorite spot to run, or walk the dog. In the distance one can just make out the Olympic Mountains of Washington State. Seaside getaway: A few miles outside downtown Victoria, in the village of Oak Bay, the Oak Bay Beach Hotel is a sumptuous retreat with seaside views, luxe suites, outdoor heated mineral pools, and several dining spaces, like this one. The most scenic, fun and convenient way to get from Vic to Van is via seaplane. What a way to arrive in Vancouver: by seaplane. The massive statement bar at the hot restaurant Nightingale, serving New Canadian cuisine, in Vancouver. The secret to getting a table is to accidentally have a really late lunch. Kate Rogers and I had the place to ourselves. 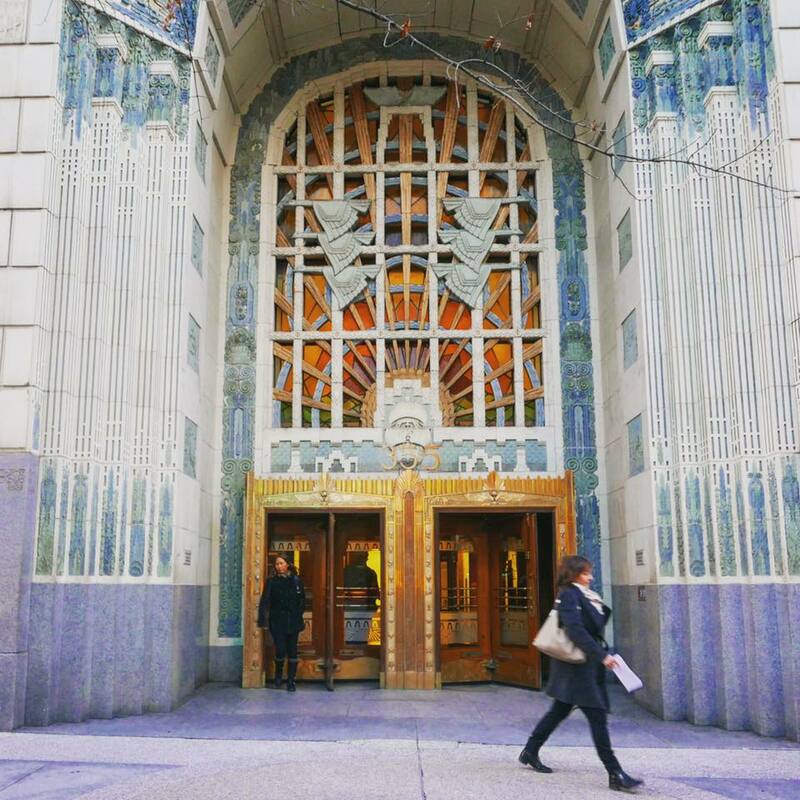 I can see why Vancouver’s Marine Building, with its Art Deco facade, at 355 Burrard Street, has had cameos in many movies and TV shows. Formidable and fancy! I’m not at an aquarium; I’m at the airport. Vancouver International (YVR) has everything to delight, inspire, entertain, eat, and otherwise survive a layover. Best of all is the in-airport Fairmont hotel with views of arriving and departing planes. If I ever have get stuck at an airport, make it this one. Bye, BC! Even during a cold snap, the region is warm and inviting, made warmer by the company of friends (and their furry friends). Hope to see British Columbia pals I missed next time! This is the second in a series of two posts; see the first one here.